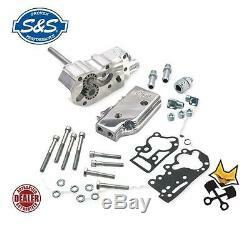 S&S® Billet Universal Oil Pump Only Kit For 1992-'99 HD®Big Twins. 1992-'99 HD® big twin. Fitment:1992-'99 HD® big twin. Features & Benefits:Universial cover. Machined with an oil pressure relief bleed off valve to maintain consistent oil pressure from the time the engine is started to the time it's shut off. Oil pressure regulation bypass route allows excess oil not used by the engine to return directly to the supply side of the pump, reducing foaming and cavitation. No thicker than a stock pump. Equipped with a stock length oil pump drive shaft. Includes: Complete oil pump assembly, Oil pump driveshaft, Miscellaneous hose fittings, plugs and Paper gaskets with Mounting hardware. Gears and shims not included. Note: Chrome Plating the Pump & It is extremely difficult to chrome plate an oil pump without getting chrome in the passageways, cavities or on the machined surfaces where the gears, check ball, and pressure valve operates. Chrome in these areas as well as on the gasket surfaces impairs the pumps performance by altering the operating tolerances machined into the parts. In addition, abrasive particles of chrome may break loose causing damage to the pump and the engine. Because of this, S&S® does not recommend chrome plating the pump body or cover. Kit includes oil pump, universal cover with top and bottom feeds, mounting bolts, supply and return gears, drive shaft with keys and snap rings, check ball and spring, pressure relief valve and spring, check ball and release valve cover screws with O-rings, miscellaneous hose fittings, plugs, screws and gaskets. Pump features a smoother design and pressure relief towers that are. 300 shorter than the OEM oil pump. Accepts 3/8 rubber oil lines. See Fitment Chart by Clicking Tab Below. This includes but is not limited to items showing signs of installation or attempted/improper installation (mounting marks, scratches, scuffs), mounted tires/wheels, windshields, discolored exhaust, programmed fuel tuners, bluetooth/communication devices, apparel, items installed contrary to manufacturers specifications, seats, etc. All products are warranted against manufacturers defects. Dyna Glide Custom - FXDC. Dyna Low Rider - FXDL. Dyna Super Glide - FXD. Dyna Wide Glide - FXDWG. Electra Glide Classic - FLHTC. Electra Glide Classic Injected - FLHTC I. Electra Glide Sport - FLHS. Electra Glide Standard - FLHT. Electra Glide Ultra Classic - FLHTCU. Electra Glide Ultra Classic Injected - FLHTCU I. Low Rider Convertible - FXRS-CONV. Low Rider Custom - FXLR. Low Rider Sport - FXRS-SP. Softail Night Train - FXSTB. Softail Springer Bad Boy - FXSTSB. Tour Glide Classic - FLTC. Tour Glide Ultra Classic - FLTCU. Tour Glide Ultra Classic Injected - FLTCU I. The item "S&S BILLET OIL PUMP KIT FOR HARLEY 1992-99 EVO WITH UNIVERSAL COVER 31-6205" is in sale since Monday, January 9, 2017. This item is in the category "eBay Motors\Parts & Accessories\Motorcycle Parts\Engines & Engine Parts\Oil Pumps". The seller is "shopthefox" and is located in Milwaukee, Wisconsin.